A working WiFi or wired internet connection. 3G/4G connection may work but may be slow or even unstable. LTE connection may prove to be much better. Click on "Add Account" in the center of the screen. The the "Address" field type "https://vsst.stonybrook.edu" and touch Next. In the "User Name" field type your NetID and touch "Next" on the keypad. Enter your NetID password and touch "Next" on your keypad again. In the "Domain" field enter "sunysb.edu" and touch "Go" on your keypad. Touch the Apps tab on he far right side of the screen. This will expose the complete selection of applications which are organized into groups. Touch the group names to see what apps are available in each. 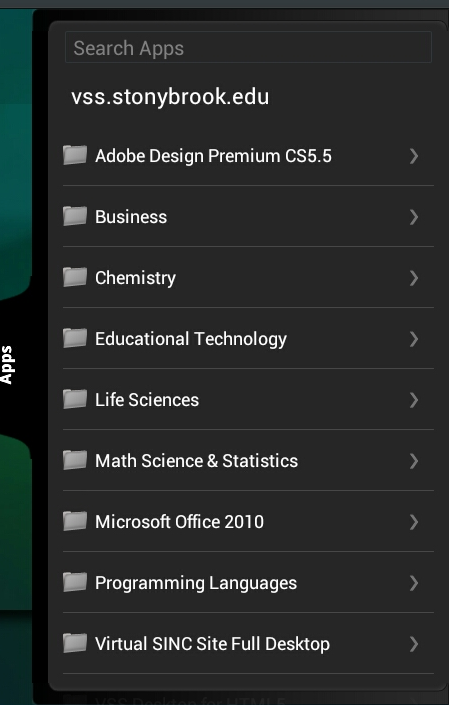 Selecting the apps bookmarks them and they will begin to populate the main screen. Once you're done, you may begin by touching on your bookmarked apps. Not all apps are individually available. These can be accessed in the "Virtual SINC Site Desktop" app under the "Virtual SINC Site Full Desktop" group. End your sessions by closing your apps. If in the "Virtual SINC Site Desktop" app. Go into the Start Menu and select "log off." In Citrix Receiver, touch "Log Off" in the upper right corner of the screen. Touch the icon that looks like 3 horizontal bars in the far upper right corner of your tablet. When using the Virtual SINC Site, you will see a removable drive. This is your tablet's internal storage. Print from Anywhere is built into the Virtual SINC Site. When in any app, you will see a small bar hugging the top of the screen. Touching it will expose the what it can do. The Home buttom returns you to the Android screen. The Keyboard button shows the keypad to type. The Cursor button activates a PC mouse like function. The Circle with a cursor button is a magifying glass function. Next is the Scroll button to scroll up and down pages. The circle with a hand button is the Gestures Guide to remind you what touch gestures you can use. The X button is to disconnect the session. Do not use this when in the full desktop session. Only use this for apps.